Wednesday, May 29, departing at 8:00am (7:30am from the subway). Cost: 460 RMB (415 RMB for members); Difficulty Level 3+. In Brief: Hike a recently repaired section of Great Wall that offers amazing long views before getting on to an unrepaired 'wild' stretch that will take us over to the Little West Lake. A view of a tower on the Longquanyu stretch of Great Wall. approx. 4 hours start to finish over 7km. Includes a meal after the hike. Note: there are some very steep descents in the first section of the hike. The Longquanyu Great Wall is about 20km north of the Ming Tombs, and was constructed during the Ming Dynasty (1368-1644 AD). The Longquanyu Great Wall is the beginning of a long, uninterrupted stretch of Great Wall that passes through Huanghuacheng, Jiankou, and Mutianyu. 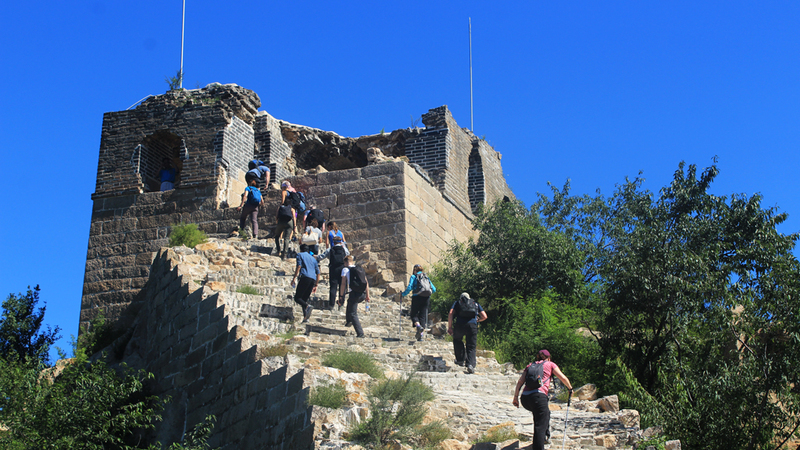 Parts of the Great Wall at Longquanyu have been repaired, and the hike will also take us along unrepaired ‘wild’ sections, making this hike a great way to see both repaired and unrepaired Great Wall. We’ll begin the hike on a repaired section. On the wall here we’ll have long views of the mountains and valleys to the east, and looking west we’ll be able to see all the wall that we’ll be hiking on later. The first repaired section is flat for the most part, but there are two very steep descents, including a steep dive down into a valley—not a lot of fun if you are not good with heights. We follow the Great Wall up into the mountains on the other side of the valley, hiking on to the first of the unrepaired sections we’ll pass on the hike. A highlight of this section is a special spot where the wall meets a cliff that forms a natural barrier, the steps of the wall leading up to a sheer cliff. It makes a good spot for a short break, but there’s not much room for sitting. 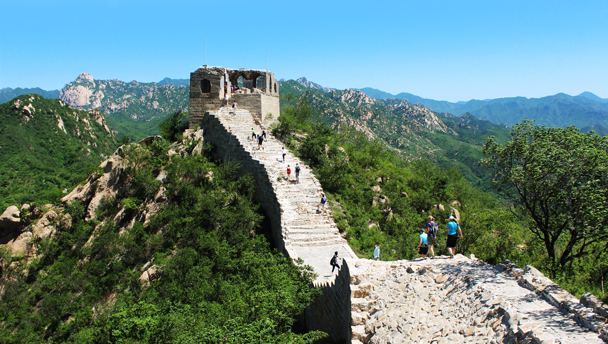 We’ll offer the option to climb up for a look, and then backtrack a little to take a hillside detour, walking through chestnut orchards to get back to the Great Wall. This next part of the hike follows the last little bit of unrestored ‘wild’ wall in the area. We’ll make a short, steep climb up on the wall, and then follow a path along a relatively flat section that is overgrown by trees and other foliage. After about 1km we’ll be back on to restored Great Wall. To get around another cliff we’ll follow a thin dirt trail down the hill, into the valley, and then past the remnants of a water pass as we head for the Little West Lake. From here the walking is flat and easy, following park trails over boardwalks and bridges and alongside the Little West Lake, a reservoir formed by a dam. We’ll head out to the carpark to meet our bus, and take a short drive to the restaurant where we’ll have our late lunch. Some parts of the Great Wall here are really steep. We’re on the wall for about 3km, out of a total of 7km for the whole hike. Level 3+ is a ‘tougher’ moderate hike. There may be long climbs up hills, and there may be steep sections. We had cool but clear weather on this hike on the Great Wall at Longquanyu—see 22 photos of Great Wall, mountains, and the frozen reservoirs at the Little West Lake. We saw a fine mix of autumn colours on the hike from Longquanyu to the Little West Lake—check out 13 photos. Beautiful weather and steep sections of Great Wall on the Longquanyu to the Little West Lake hiking trail—see a set of 22 photos from the hike. Lovely blue skies and long views of the Great Wall at Longquanyu—see 12 photos. See 29 photos from an overcast but clear day on the Great Wall at Longquanyu Great Wall. See 30 photos from our hike on the Longquanyu Great Wall. See a set of 21 photos from our hike Longquanyu Great Wall to the Little West Lake hike—hills, mountains, ice, and Great Wall! See a set of 26 photos from our hike from the Longquanyu Great Wall to the Little West Lake. Eleven photos from a walk around the Longquanyu Great Wall. Fifteen photos from our hike along the Great Wall at Longquanyu, crossing both repaired and unrestored sections of wall. Thirteen photos of the Great Wall at Longquanyu on a clear and sunny day. 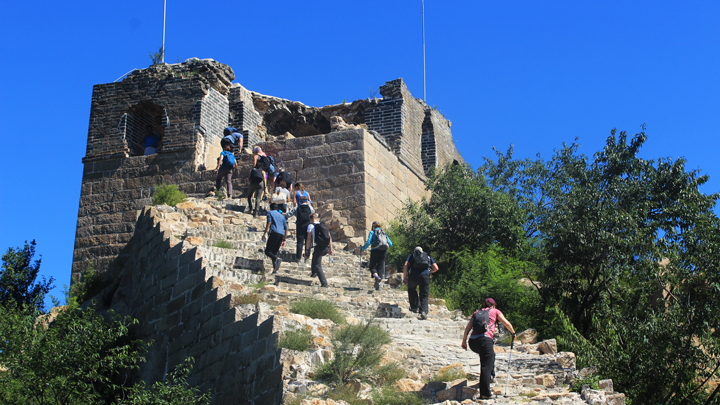 Photos of a spring hike on the recently restored section of Longquanyu Great Wall. Eleven photos of Great Wall, hills, valleys, and flowers from a hike at Longquanyu. Sixteen photos from a hike that covered a mix of wild and recently restored Great Wall. 25 photos from a hike along the Longquanyu Great Wall. Photos of the ice we walked over in a valley in Longquanyu. This early spring hike had us walking along top of a ridge as well as through the bottom of a valley. We followed the Great Wall and enjoyed fantastic views of the mountains north of Beijing before we started following a semi-frozen river up the valley. The temperatures were starting to warm up, but there was still some ice on the ground! Click through for photos and more!